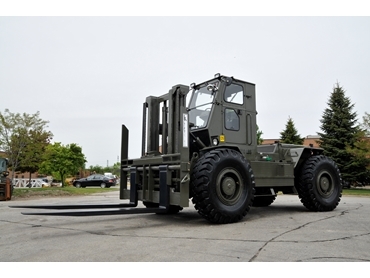 Lencrow Group ’s addition of the Liftking range of heavy duty rough terrain forklifts has helped the handling equipment company gain a contract with the RAAF. The Liftking range of heavy duty rough terrain forklifts, offers 2 – 25 tone units that are built in extreme conditions and provide 500mm of ground clearance, wide track and long wheel base. Lencrow has been awarded the contract with the RAAF to supply 12 air transportable five tone forklifts, which are due to be delivered by the New Year. The units have very strict size and weight requirements, are all four wheeled drive and steer and have the ability to work on any terrain and in water up to 1200mm deep. Ross Grassick, Managing Director of Lencrow, had visited the Liftking factory in Toronto, Canada. “I was impressed with Liftkings ability to build units to suit customer’s requirements,” says Grassick. Lencrow Group has been involved in specialised all terrain forklifts since the early 1980s in both hire and sales. Lencrow will be also providing back up support and training in operations and maintenance as part of the RAAF contract.